"This band is dynamic!! 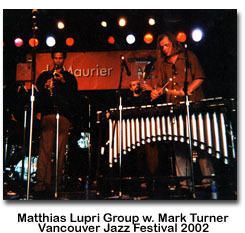 Pure, unadulterated adrenalin with a jazz persona..."
Matthias Lupri Electric Band is an electric modern styled jazz-fusion outfit. The group will take you on a journey through catchy tunes made-up on interesting grooves, harmonic jazz colors and improvised soloing. 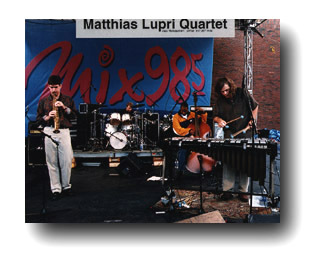 First conceived when all the Electric Band members were students at the Berklee College of Music, Matthias Lupri Electric Band is still going strong today. 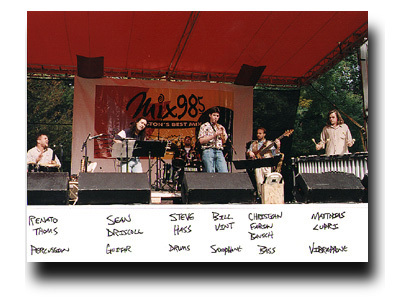 With the added dimension of the electric midi vibraphone, this group should not be missed. (MP3) "Gimmes Never Get (Van Endert)"
(MP3) "Groovin at the Deli (Lupri)"
playing music from the debut CD "Window Up Window Down." It's been another busy season for the group, with a coast to coast tour of the Canadian Jazz Festivals and US dates this past summer, with saxophonists Mark Turner and Rick Margitza. Nate Radley (g), Thomson Kneeland (b) and Barry Romberg (dr) rounded out the group on tour. 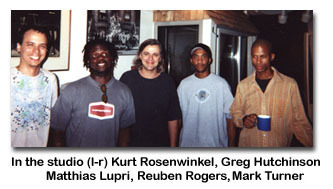 Music was primarily from the new CD Same Time Twice plus some tunes from the previous CD's. Box 161, 295 East Swedesford Rd.